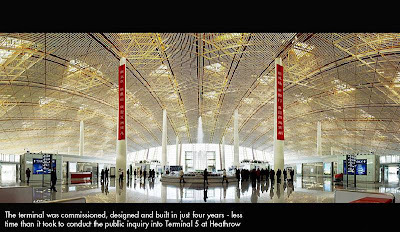 Home Asia China World Beijing International Airport (PEK) Terminal 3 - Will Beijing Really Be Ready For The Olympics? Firstly, the architecture and size etc are really amazing... a job well done. As far as the logistics are concerned, they have a very, very long way to go in order to get ready for the 2008 Olympic visitors. 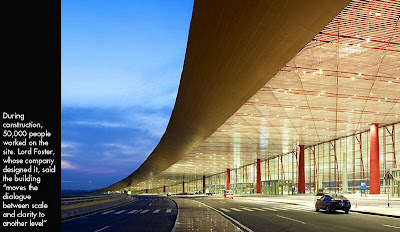 I arrived at T3 in Beijing on a red-eye flight from Singapore (SIA) at 7:20am on Tuesday morning. Due to the class travelled, the status of my kris flyer membership, and the APEC card I hold to move through the diplomatic channel at immigration, I was the first to arrive at the baggage collection - so far no problems. After collecting my bag from the carousel, I was the first to head toward customs to exit the terminal. This is where things went very wrong. The signage (of which there is very little) for arrivals is very misleading. After asking a security office for directions to customs, I ended up in a queue, and after 10-min waiting was asked for my boarding pass. When I explained that I was arriving, the attendant could not speak english and my mandarin was too poor for her to understand. She called another security person to talk to me, who then advised that I was in fact on the wrong floor - I needed to leave floor 2 and go to floor 4. Even though I was dubious about this, I got on the elevator to floor 4, where I exited into the main part of the terminal (in departures) with absolutely no security or customs check - lucky I was not a terrorist or drug trafficker!! Then I had to cross to the other side of the terminal, get an elevator back to the 2nd floor (where I saw that I was on the outside of the customs area), and an escalator ride down to where I eventually caught a taxi - total time after collecting baggage was about half hour, and no security checks - as a traveller who visits numerous airports, this was a very daunting and amazing experience for me - goodness knows what infrequent travellers will go through in August?? When I was departing - I went up the diplomatic channel again at immigration... this time there was no-one in attendance, and once I was on the other side (unchecked), I had to ask someone at baggage scanning to get someone to go back and stamp my passport for me (which they did) - otherwise they would think I was still in China. In all, I was very disappointed with the experience, after all the hype... I was looking forward to visiting T3... my colleagues that also landed in to Beijing this week all had similar (or even worse) experiences... 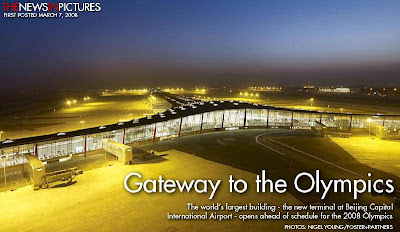 I sincerely hope that they fix all the bugs before the Olympic traffic hits... it doesn't matter how pretty or state of the art the design, runway, architecture ete etc is, without the proper logistics and support for the traveller, it's similar to travelling through sub-standard airports like those in India. 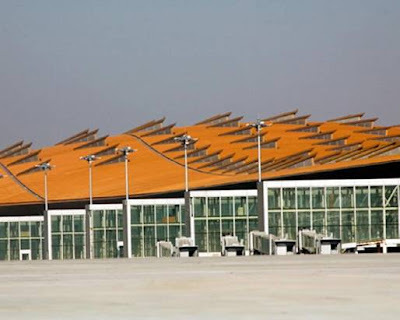 The terminal cost a reported 27 Billion Yuan ($3.65 Billion) and took less than 4 years to build. During construction had 50,000 workers on site. Floor Area 1.3 Million Square Metres. 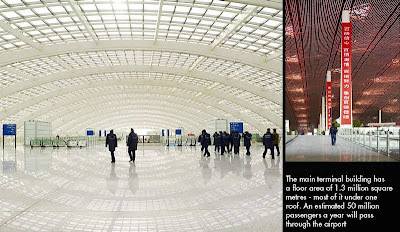 Over 4 Km Long Which Makes It The Worlds Largest Building. Has an Automated People Mover (A P M) which travels at 80 k/hr. 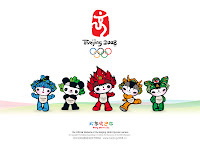 Has 84 shops and over 100 restaurants. 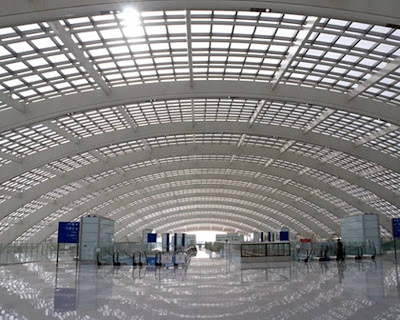 Terminal 3's curved roof contains thousands of skylights. 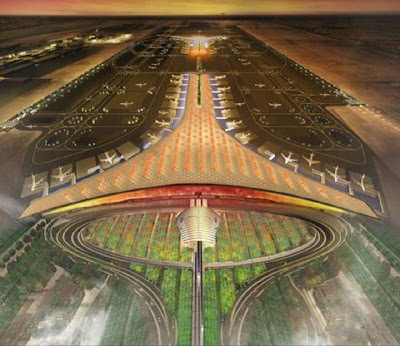 The orientation to the southeast is intended to maximize the heat gain from the early morning sun, helping to reduce the amount of energy expended by the structure for heating. The golden tint, meanwhile, is meant to evoke the colours of Beijing's Forbidden City, the Ming Dynasty-era imperial palace at the city's centre. Wow, now that is very interesting. 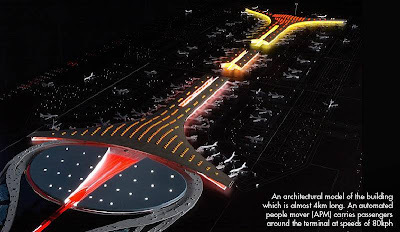 I would certainly expect a lot more for such a prestigeous airport. Looks amazing. Problems seems quite common with Chinese products. They tend to look good, but when you look at the instructions you get really confused. Too much investment on hardware and not enough on user friendly aspects. Like most things in China, we are impressed at first... then we get frustrated ! Yeh - I don't mean to put it down, because it really is a beautiful facility... I was just very frustrated by the time the plane home boarded, and actually suprised after all the hype. I'm sure they will get it ready in time for August.